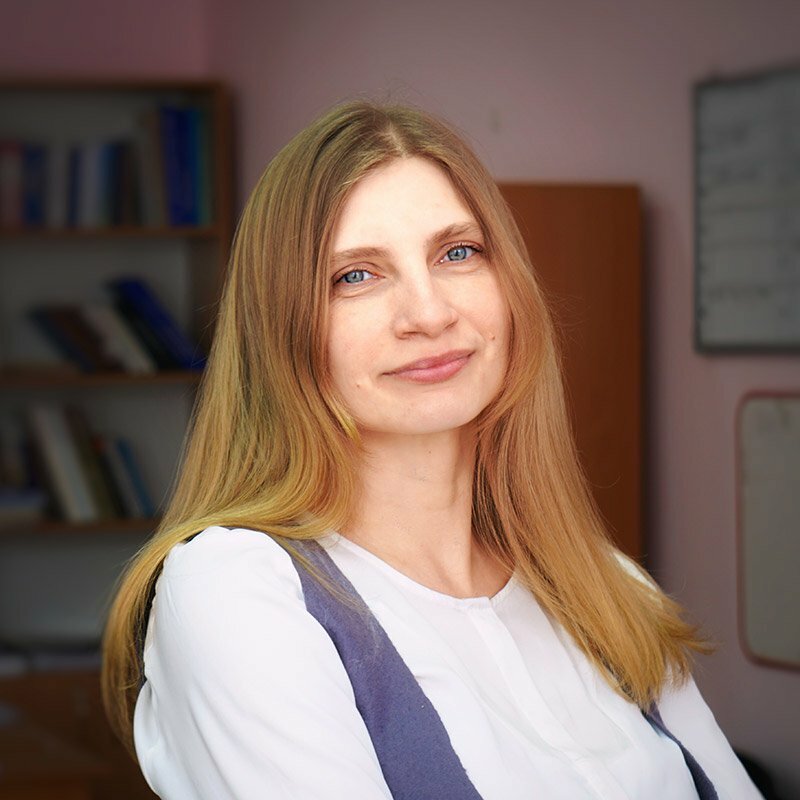 Sobolieva Olena Volodymyrivna is an ethnologist and a senior researcher at the Research Institute of Ukrainian Studies of the Ministry of Education and Science of Ukraine. Her range of academic interests comprises traditional culture of the Crimean Tatars, modern ethnocultural processes in the Autonomous Republic of Crimea, everyday Islam, anthropology of science and knowledge. She passed PhD defence in 2009. She is the author of monograph “Wedding of the Crimean Tatars: Traditional Forms and Transformations” (2015). She is the head of NGO “Center for Applied Anthropology” and a member of the National Association of Ethnographers of Ukraine. Ornek is a traditional ornament in the applied arts of the Crimean Tatars. This ornament embellished various items of everyday life and worship: clothes, fabrics, jewelry, furniture, architectural objects and tombstones. A system of workshop production was peculiar in the Crimean Khanate. There were workshops of artisans in every big city: weavers, jewelers, embroiderers, furriers, tinsmiths and the like. The Crimean nobility bought high-quality products. The items also found their buyers in other countries. 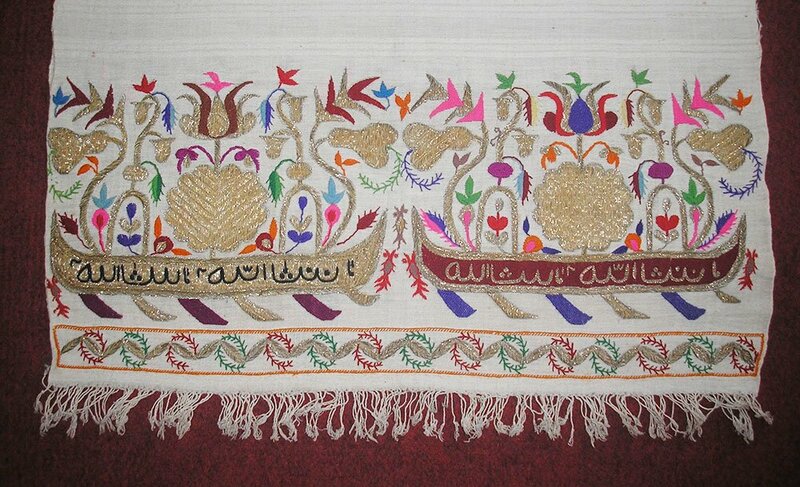 In addition to professional handicraft production, home crafts, such as embroidery and weaving, were widespread. The silver woman's belt and "marama", the cloth to cover the head. Private collection. The true cultural heritage of Ukraine is "Tatar Ishleme", the traditional two-sided embroidery of the Crimean Tatars, which has more than 60 different stitches. 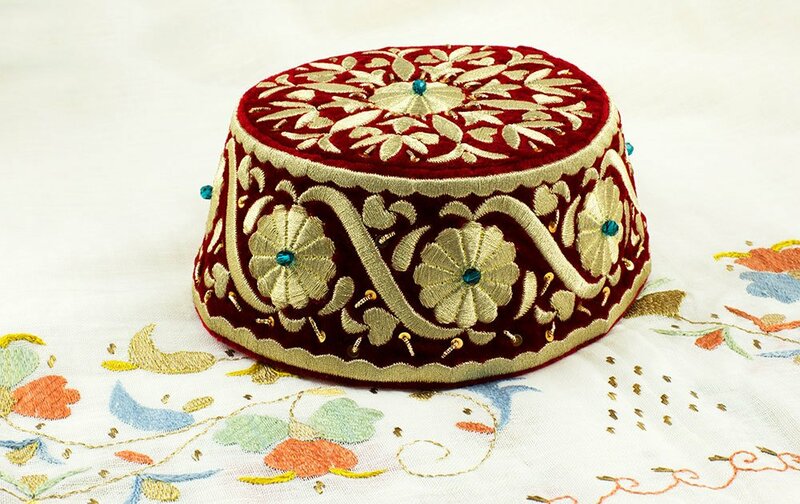 A characteristic feature of the "Tatar Ishleme" embroidery is the use of pastel colors in combination with silver and gold threads. This ornament has acquired the geometric shapes in weaving and carpet weaving. Usually, flax, cotton, wool and silk were used for weaving. 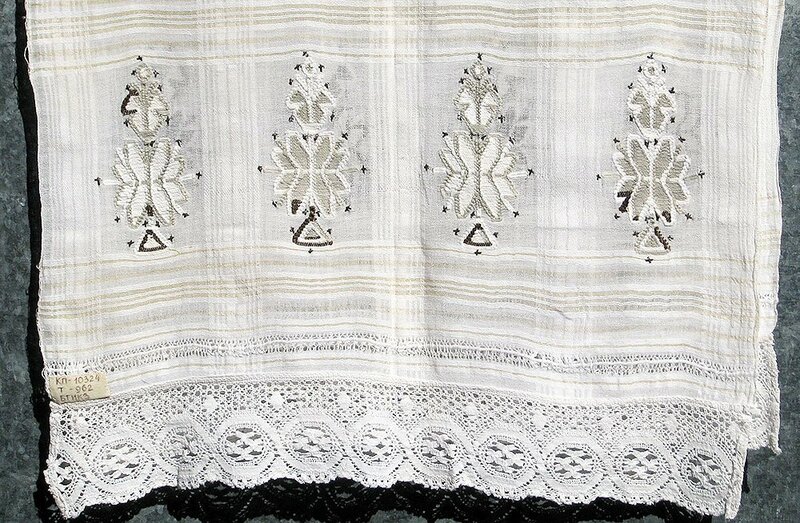 The linen fabric, produced by the Crimean Tatars, was marked by tenderness and softness. In jewelry, the traditional ornament is of special beauty. The most widespread technique was filigree, the production of jewelry from thin silver wire. The ornamental motifs, depicted in various handicraft items, had their stylistic features, which depended directly on the technique of execution and materials used. 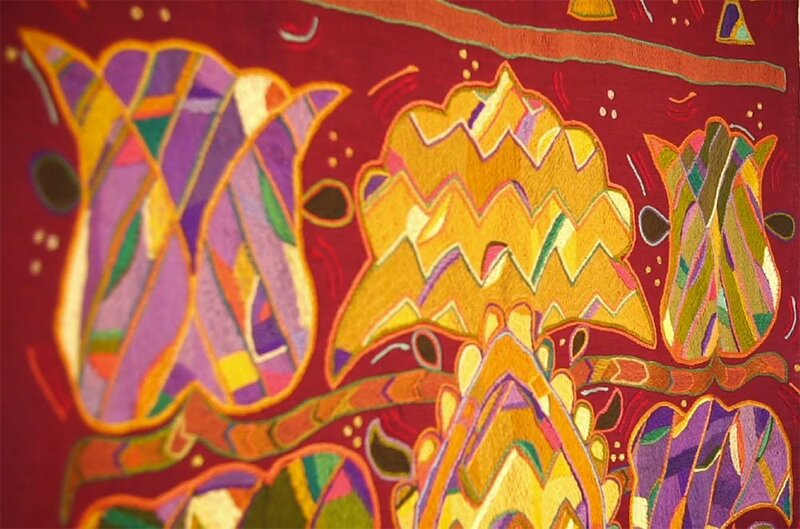 The main motifs of the pattern are divided into two groups: floral and geometric. 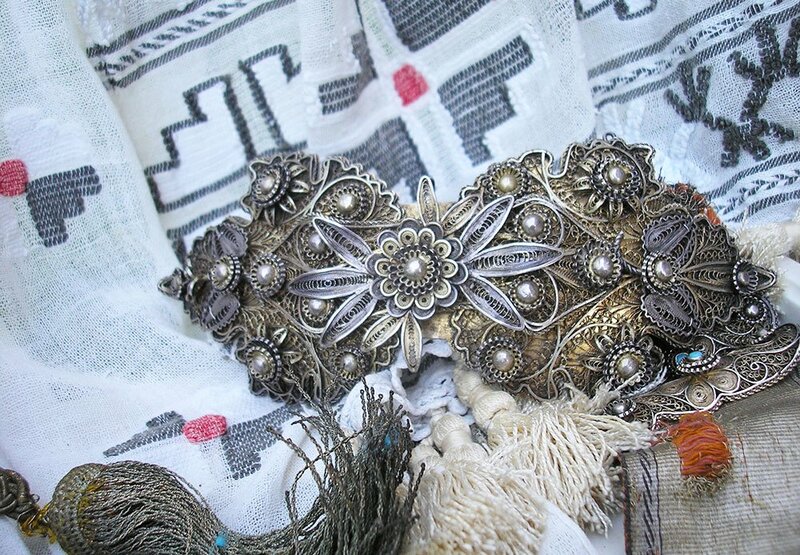 The floral ornament is typical for embroidery, carving on stone and jewelry art. Geometric motifs prevail in weaving and carpet weaving. The traditional ornament, in addition to its artistic and aesthetic value, had an important magic and sign function. Special information was encoded in such an ornament, which, with the help of special signs symbolizing magical content, protected against evil forces. Goods, embellished with traditional ornament, decorated the interior of the houses. These were towels ("eu-jiyar", "yagbez", and "sofa-peshkir"), napkins ("yemeni"), handkerchiefs, and curtains, carved wooden chests ("sandyk") and copper utensils. The interior of the room of the bride was richly decorated. Before the wedding, the girl was preparing a dowry, which included hundreds of household items that the girl embroidered together with her girlfriends. During the wedding, the room of the bride was festively decorated. Dozens of ropes were fastened under the ceiling, diverging radially from the center. All the fabrics and clothing richly decorated with embroidered and woven ornament were hung on these ropes and around the perimeter of the wall,. Items, decorated with traditional ornamentation, were important attributes in many rites. Fabrics and items of clothing were universal gifts during all family and public rituals. 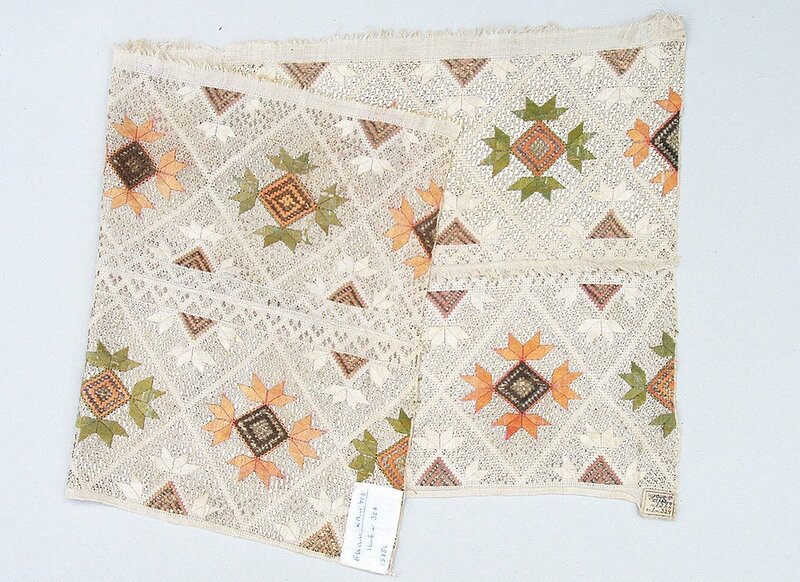 During the circumcision (“sunnet”) and wedding ("toi"), the winners of the traditional wrestling ("kuresh") or horse racing ("koshu") received embroidered vests, scarves and livestock. The bride was preparing for a bridegroom a set of gifts of nine items, established by the tradition: a tobacco pouch, garters for socks, a towel for a rite of shaving, an "ochkur" belt, etc. The events of deportation of 1944 caused the irreparable losses to the ornamental art of the Crimean Tatars as the people were put in the conditions of survival. The revival of various folk crafts (jewelry, pottery, weaving and embroidery) began in the early 1990s . 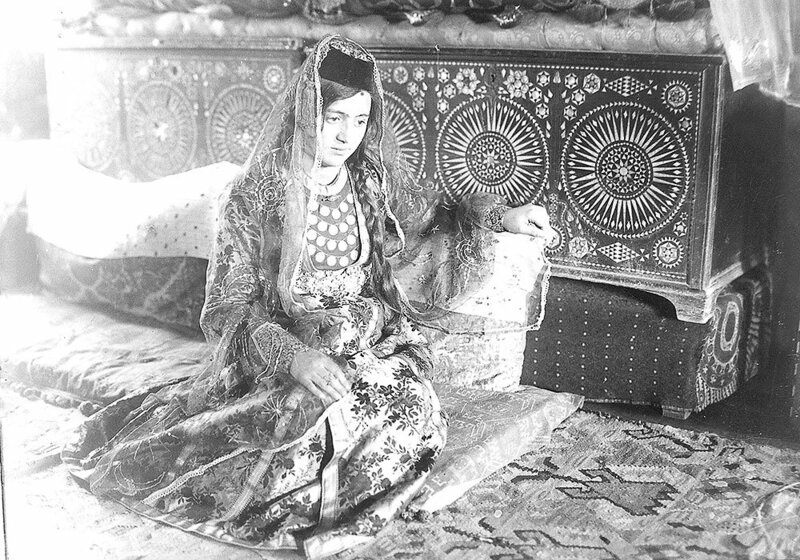 In particular, in 1991 in Simferopil, the courses on traditional embroidery started to operate, on which Zuleikha Bekirova, the inheritable craftsman, passed her knowledge. 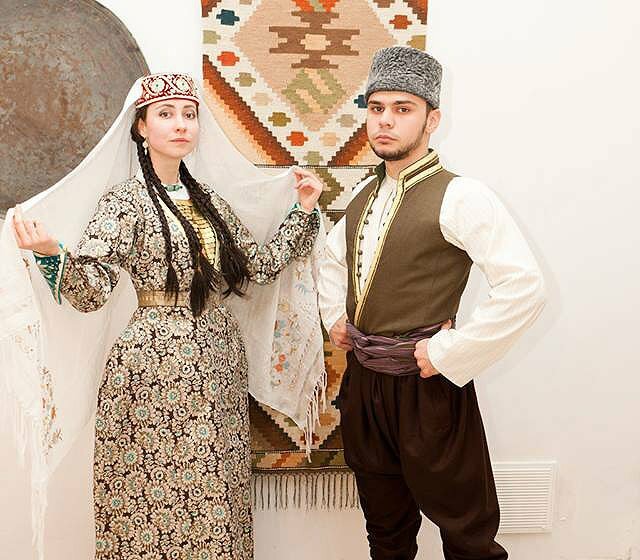 Today, such craftsmen as Elvira Osmanova, Julia Tulupova, Gulnara Negliadenko, Tamara Kliuchkina and Khatidzhe Iunusova and others work in the technique of the Crimean-Tartar embroidery "Tatars-Ishleme" and "Mklama". In the early 2000s, Aider Asanov, the inheritable jeweler, began his work and taught over 20 students of his craft. The artist and art critic Mamut Churlu made an outstanding contribution to the development of Ornek, the traditional Crimean-Tatar ornament. A series of seminars and exhibitions organized by him promoted the spreading of ornamentation of Ornek in the most diverse kinds of folk crafts and its artistic interpretation. Ornek ornament is used in ceramics (Rustem Skybin, Maryna Kurukchi, Mamut Churlu, Eldar Gusenov), carpet weaving (Mamut Churlu, Iryna Teslenko), art panels (Gulnara Negliadenko, Mamut Churlu, Julia Tulupova) and painting on glass (Zera Abliazisova, Afize Iusuf-kyzy). The peculiarities of the use of ornament in contemporary art items are the combination of different techniques and methods in one piece of art. On February 12, 2018, the Ornek ornament was included into the National List of Elements of the Intangible Cultural Heritage of Ukraine. Akchurina-Muftieva N. Applied art of the Crimean Tatars of the 15th - the 1st half of the 20th century. Simferopol, 2008. 392 p.
Chepurina P. Ia. Ornamental sewing of the Crimea. M. - L., 1938. 64 p.
Some photos were kindly provided by NGO "Alyem".